This part of my life is back in Charlotte North Carolina, around 1989. This is a 1965 Corvair Corsa that belongs to a friend of mine. This car was pulled out of the woods about a half a mile and looked nothing like it does today. The top is one piece and handmade. Tom did all the work himself in his garage during his spare time, with a little help from his friends. Tom climbs telephone poles for a living and does repairs to phone lines. The paint job consist of about 15 or 20 coats of lacquer, hand rubbed and polished to a mirror shine. On a Corvair the motor is in the back where you would expect the trunk to be. ( A rear engine car ) Well he took that motor out and put in a V-8 where the rear seats go to turn it in to a mid engine vehicle. At the time of this photo he had one more in the garage that he was working on, turning it in to another V-8 to use as a daily driver. The motor is a 350 with an Edelbrock Tunnel Ram. And if you look closely at the front where the trunk is, you will see an nitrous bottle. All this baby needs is wigs cause it will flat out scream. That's me sitting in it at a car show in Charlotte Motor Speed way. The only time he drives it is to a car show. And on the day this picture was taken I had the chance to ride with him to the show. "Talk about fun"! He and his car have been featured in an issue of Car Craft Magazine. I still have a copy. You can read it here. See the 64 coupe I wrecked here. 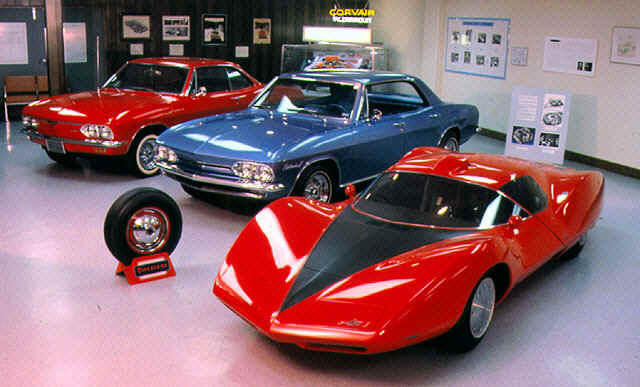 I also have this car and the Corvair I wrecked on video tape. It is something that needs to be seen to appreciate. Words can not do it justice. The pin strips are 24k gold with the words Corvair V-8 in 24k gold on the front and rear spoiler. This is the only photo of it I have to share with you. Wish I had more. But "hay", I got it on video.